that I dropped upon the beach…. Just dropping lines and thoughts…. When I was younger poems were something I loved to read but was no good at writing. I mean yeah I could string the words together and could write but not poems. Poems for me weren’t like story’s, you could lose yourself in a story but a poem? that could transport you to a mystical magical place…. Thats how it was for me. I tried poems, I wrote them to friends, in birthday cards and letters. Everyone I knew said they were great but I didn’t believe so. I went round to a friends one day when I was 16 and a man was sat in a chair drinking a cup of tea. I didn’t know him didn’t recognise him but he was a friend of the family and my mate Lee’s parents weren’t back yet. It was Lee’s birthday and I gave him his card with another poem in it, Smiling he said to this man that I was good at poems. Handing him the card to read he disappeared and came back a few mins later with every poem, letter and silly story I had ever writ him, I was kinda shocked he kept them. The man sat reading them quietly for ages then said to me and this I will always remember…. He also said that the best writers are those that aren’t afraid to write about any topic, he was talking to me personally about poem writers but it applies to all. I took what he said and remembered it. I try very hard to make sure that every poem I write has feeling, that hopefully, you the reader enjoys it. Good, bad, happy, sad, emotional, anger, despair, depression, love. Sometimes I have to look so deep into myself to find that feeling in order to show it in a poem. No topic is safe. I will write about anything and everything. Every poem I write is not necessarily how I’m feeling that day. That man? the one who told me that? He’s an author and grew up with Lee’s dad in America. I didn’t realise till about 5 years later when I saw his picture on a dust jacket of the book I was buying. At the time, being 16, and the way I was it was more interesting breaking the law and ignoring adults than listening to what they had to say. Lee and his family went to Australia for a better life when I was 18. I spoke to him a few days ago and he told me he still has those letters and poems and stuff. I laughed and asked why he would keep them? His answer? “When you finally publish something, it’s gonna be great, and, I’m gonna blessed that not only did I know you first but I have my own private collection of the real you.” How cool is that? I was stunned into silence! So I don’t know what post number 200 is gonna be yet? Maybe I should pick my favorite posts of the other 199? Or maybe just another poem? We’ll see…. Happiest of hugs to you all, I hope the weekend is just fabtastic for you! i’m on depressions board game…. all that’s left is how I feel…. I received 2 awards on the same day, how cool is that? This award has rules which are…. Do you know, I’ve never actually thought about it really? I’ll come back to it! Hmm? The Library Shakspeare Millennium Edition, Any fruit, Donald Duck, Skipping Rope, Don’t know about the DVD, I like to many! Erm? I can’t tell jokes. Don’t know, I’m still living it! 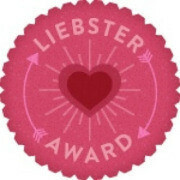 Time to nominate some fabtastic people! 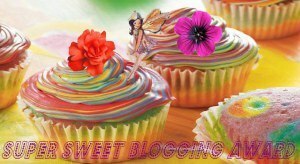 All these blogs are different and all super fantastic. I hope you like them as much as I do! 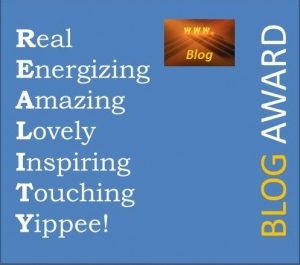 First I want to thank Tom Lucas http://readtomlucas.com for the Reality Blog Award. If you haven’t been to his blog, it’s got a little of everything for everyone. (The poems are my fav!). Like all the awards there are questions to go with it and people to nominate as well so here goes! I’d change the school system in the UK. I have good friends who are teachers and all have the same complaint…. Schooling seems to be made up of more paper work and targets and less about teaching. A harassed teacher worried about target deadlines is less likely to be a fun inspirational teacher. Next year I start my BA in Humanities, so completing it and completing it well. Time to nominate some fantastically brilliant people! I picked some truly fantastic people, hope you like them to. There are other people but I have other awards and they will appear there! Hope the rest of your day is fantastic.x. Hi! How are you? Fab I hope! I like to take a word and write my impression of it ( Have you noticed? ). I’ve 25 of them going back quite a while now. I love words, like how one little word can have such a big meaning or one very long word can mean something small. So in thinking about words, here’s my question…. What is your interpretation of one of or both of the following words? 1. A nonstandard usage or grammatical construction. 2. A violation of etiquette. 3. An impropriety, mistake, or incongruity. I’ve put what the words mean ( just to remind you ). So written in either a poem or a thought, what is your impression of the above words? Well, happy hugs to ALL of you.x.x. you walk on laws edge….